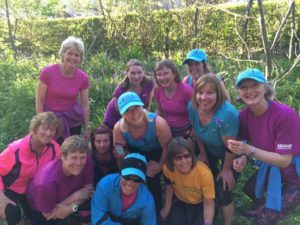 Our Women-only running club offers a non-competitive environment for women to get out and run, and have a bit of fun along the way. 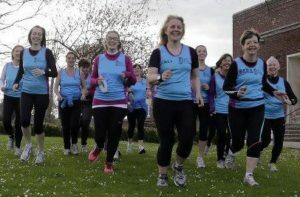 To encourage women of all abilities and ages to run in a safe and social environment. To offer coaching and encourage women to take part in races and running events. To promote the club within the local community. Anyone who is able to jog slowly for about 30 minutes will be fine with us. We always have a leader at the back and you will never be left behind. What if i am an absolute beginner? If you have never run before please contact us on enquiries@dorsetsolesisters.com to get advice. we sometimes hold beginners courses or we can help you prepare to be able to enjoy running with us. In the winter months we meet on Mondays in Dorchester at 6pm and on Wednesday in Weymouth at 6.15pm. where we meet. In the Summer we take advantage of the light evenings and run in country locations. The meeting place will be included on the runs list with travel directions. There is usually the chance to meet at the normal Dorchester/ Weymouth meeting points and share lifts. To come running with us, just turn up at the right place on the right night. There is no need to tell someone you are coming, but please do feel free to contact us on your first night so the leaders know to look out for you. Each run will have at least two qualified and insured leaders. One will give the group directions for the run and one will look after the health and safety of the run and make sure everyone is ok. you will never be left behind, now matter how slow you are there will always be someone with you. We always keep the groups together, so if you are a faster runner you will use the “doubling back” system to keep to keep in touch with the groups and the leaders. Any conditions that requires regular checks and medication. Please indicate any medial conditions or your physical activity readiness questionnaire. If you have given blood or feel unwell in the 48 hours prior to a club run we advise you not to come. If you feel unwell during your run, please inform your leader.